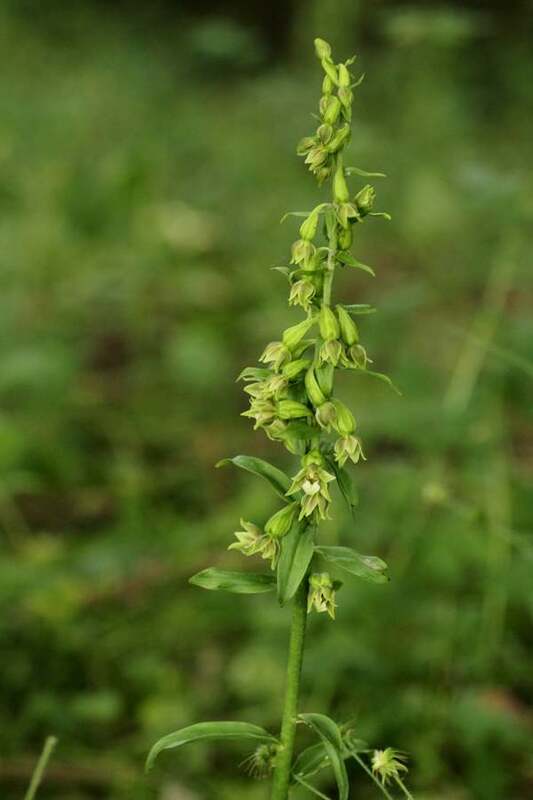 The flowering of Green-flowered Helleborine is sporadic and the fact that it blends in so well with its background makes it one the most difficult orchids to find. Its appearance is also variable making accurate identification very problematic. The plant grows up to about 40 cm in height with a series of well-spaced leaves in facing ranks on either side of the stem. The inflorescences have around 20 individual flowers which seem to be almost permanently in bud. When the flowers do open they only open partially revealing a paler green lip which may sometimes be flushed with pink. 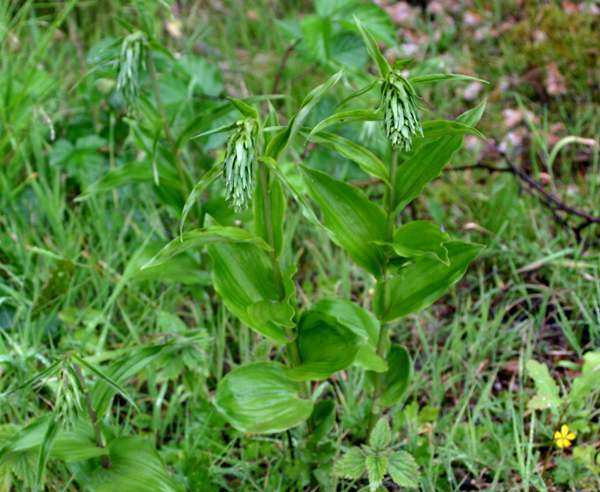 The range of this plant is rather difficult to determine with any degree of accuracy because it is frequently confused with other Epipactis species. Epipactis phyllanthes occurs in scattered colonies throughout England in Dorset, Kent, Norfolk and Cumbria. In Wales it occurs in some coastal dune systems, particularly at Kenfig National Nature Reserve, Whitford Burrows and Morfa Dyffryn. In Flintshire it occurs in woodland. In Ireland there are sites in Co. Dublin, Leitrim and Fermanagh. Epipactis phyllanthes is also recorded in parts of western Europe from Denmark south to Belgium, France and northern Spain. 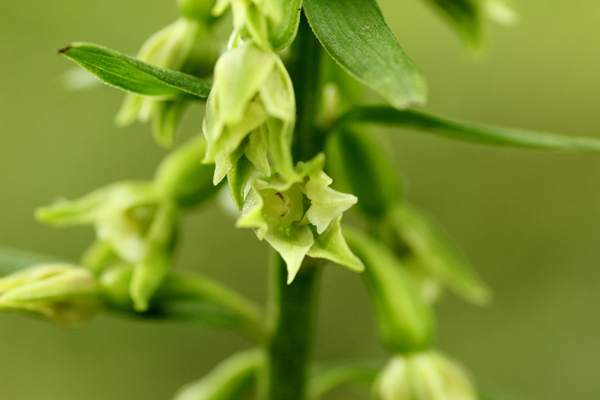 Green-flowered Helleborine grows in coastal dunes and woodlands. In deepwoodland the plants are sometimes shorter and have fewer flowers. 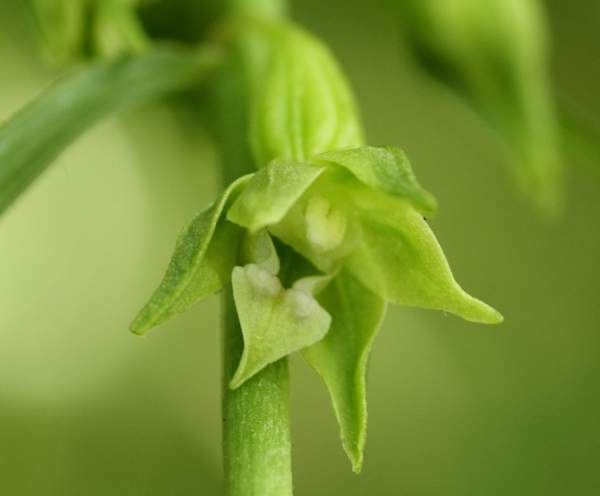 Green-flowered Helleborine flowers from July to September.